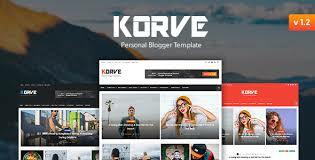 Korve Blogger Template - Free Download: Korve is a Clean, Elegant and Personal Blogger Template specially made for creative bloggers. It provides clean, clutter free and gorgeous minimalistic layouts that make your content look great on any kind of device. It is ideal for personal, lifestyle blogs . Fully Responsive Design. Powerfull Admin Panel , Well Documented Easy to Customize. Unlimited Colors 3 Layout Option : Wide , Boxed , Framed Support Custom Background Featured Posts Slider With Two Popreties (Custom Label, Recent Posts) Live Customizer : Colors, Fonts. Gradients and Falt Colors Supported Post Advertisement Area . 6 Home Style : Classis & List & Grid & Grid with Sidebar & Minimal & Dark Skin. 3 Post Styles : Stander, Cover Post Image, Favorite image. 3 Post Layouts : Fullwidth, LeftSidebar RightSidebar. 6 Custom Label on Main Menu and Posts : HOT , NEW , TRENDING , EXCLUSIVE , UPDATE. Drop Down Menu Mega Menu Clean & Elegant Design. Clean Typography Clean Code with Comments Custom Widgets. Instagram Widget Custom Social Icons Widget Custom Error Page Author Box With Easy Customize & Multi Author Support Useful Shortcodes Built-In : Contact Form, Buttons, Alert Boxs. Post Formats Icon : Standard, YouTube, Vimeo, Instagram, Facebook, Twitter, Map, Soundcloud.